Topic started 5 months ago by cesar_garza01 in Featured Content. Since then 28 posts have been made by 21 users. Every month we put a U2 fan in the spotlight. The fan of the month for November 2018 is user andyuk36. Read along for the interview we had with this U2 fan. "I was visiting my gran and she got these tickets from Adam's mother and said: 'let's go and see Adam's band, they are going to be the next big thing'"
Tell us more about yourself, who are you and what do you do for a living? My name is Andrew Stevenson. I am from Burnley Lancashire in the North West of England. Up until a few years ago, you had probably not heard of Burnley, but now they are a Premier League football team, so maybe you have now haha. I am 50 years old and I work as Global Supply Chain Director for a company that makes parts for Aircraft, Formula 1 cars and the oil and gas Industry in Manchester. Previously I have worked for GE Aerospace and Rolls Royce Aerospace. I have always been lucky to have jobs that have had global travel. Traveling with my job has allowed me to collect a lot of air miles which in the past I have used to see U2 around the world and also to visit many interesting places. I lived and worked in America for a year, and I have also lived and worked in China for a year. You've been a U2 fan since the early days. How did you hear about the band, and did you think since the beginning they were going to be as big as they are nowadays? I first heard of the band through my grandmother who worked for a family in Dalkey Co Dublin in Ireland. She worked for this family for many years as estate manageress, but also helped bring the families children up. I spent most of my school holidays with my gran in Ireland. One of the kids ended up going to Rathfarnham college and was a friend of another kid there who was no other than a young Adam Clayton. Adam's parents worked for Aer Lingus at the time so were away quite a lot at weekends so this young teenager Adam used to come over to stay on a few weekends. His parents were always grateful to my gran and he kept in touch with Michael their son. As we all know Adam was a bit of a rebel and was asked to leave Rathfarnham college and so he ended up at Mount Temple. You attended the mythical concert at the National Stadium in Dublin before U2 signed their contract with Island Records, do you have any memories of that show? So how did I get to go to the infamous gig at the National stadium in February 1980? Well, I was visiting my gran and she got these tickets from Adam's mother and said: "let's go and see Adam's band, they are going to be the next big thing"......I remember the gig as it was my first ever gig. I remember enjoying Silver lining which was later to become 11 O'clock Tick Tock. which I guess it is why it is still my favourite song by U2. I remember the encore being quite an exciting thing for a 12 year old to see it looked a bit wild seeing lots of 16 and 17 tear olds leaping about. I think they payed Boy/Girl and Out of Control. I remember my gran taking me to Golden discs just off O'connell street in Dublin a few days later and buying me the U23 EP which I still have today. I also remember thinking Bono's teeth weren't that great but the band certainly had a lot of energy. You were also present in a lot of iconic U2 shows like Joshua Tree in Croke Park, ZooTV R.D.S. Arena, the Point Depot shows in 89, the famous Popmart Leeds concert (just to mention a few), can you guide us through your highlights in a lifetime of following U2 live? What is the concert that is most special to you? I never really thought I'd been to a lot of iconic gigs until I just read the question, and looking back now years later, I guess I have. Croke park in 1985 was like the band were getting pretty well known in Europe, and were really big in Ireland. It was like 4 lads playing in their hometown. I remember the opening really well "The jacks are back" and 11 O'clock Tick tock. I was at 6th form college at this time and had been to Milton Keynes bowl the week before I remember when they sang My Hometown. It was quite emotional. One thing worth pointing out as a young English lad it was still quite hostile around Croke park and a bit run down. I remember my Irish friends telling me not to be too vocal with my accent walking to and from the gig from the city. It was a different place then than it is now. The gig for Self Aid in 1986 was a little easier. It was on the south side of the city, so a bit more upmarket. There wasn't really a worry walking around Ballsbridge near the RDS but again Bono's speech before Sunday Bloody Sunday was very emotional. U2 were real heroes in Dublin by this time. I went to both nights of the Joshua Tree gigs in 1987. I remember on the first gig a lad was on the roof of the stand during Electric co, and the band stopped and told him to get down. The second night I probably witnessed the best version of With or Without You I think I have seen. Bono sang a long version with a song I didn't recognize as a snippet then: Love will tear us apart and shine like stars. I still get goosebumps listening to it today. Both gigs were like the heroes had returned home after conquering the world and you could tell how much it meant to them and the crowd to be seeing them at home. I think after these gigs in Dublin for me the crowd never really felt the same. It became more international, not just Irish people and of course one English man haha. Popmart Leeds I remember it rained really hard and I wasn't going to go. My daughter had just been born a few weeks earlier but a friend of mine had a spare ticket, so I went along. Cast were supporting; they were big in the UK at the time and I didn't really realize how good this tour was until about 10 years later. There are so many stand out gigs now when I think back. I was in new York for one of the MSG shows just after 9/11, which was very special and emotional. I also loved the 360 show I attended in Montreal. Bono singing Hallelujah into Streets was spine tingling as it started to rain. My best shows looking back were probably Croke Park in 1987. That was probably my age late teens etc and seeing how they had grown. But the great thing about U2 up until recent tours was that you would always get a surprise in the setlist, which as we all know doesn't happen a lot now. If I had to mention a show where I was a little disappointing it would be Glastonbury at the time it had rained all day. We had a great view but it was uncomfortable and I think they just didn't hit the heights. It wasn't really a U2 crowd, but again looking back it was great to be there when they played that gig. Tell us more about your story of meeting Adam in your childhood, that surely must be an experience to remember as a U2 fan. 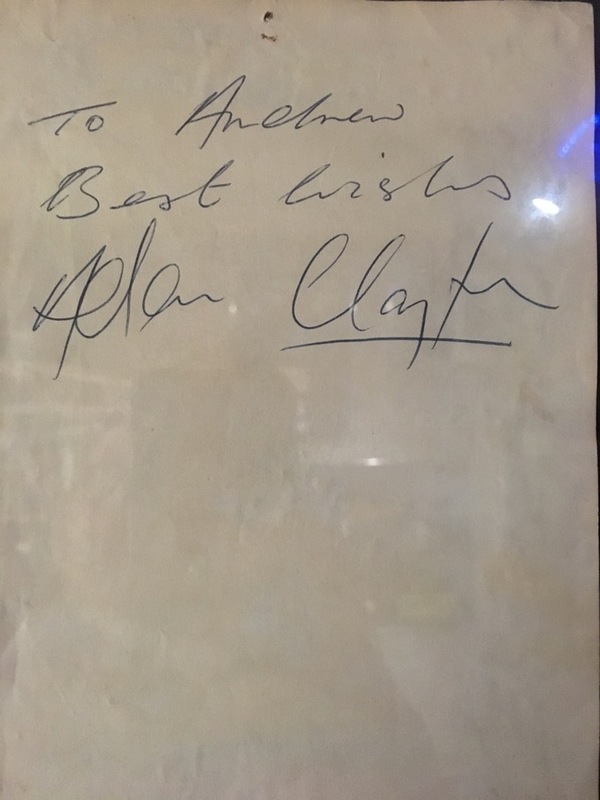 I think I mentioned the meeting Adam as young kid earlier, but I met Bono and Ali, Paul Mcguiness on an occasion in 1986 when they wanted to buy the house my gran worked at in Dalkey. Adam came around also to look with a guy called Ossie Killkenny and an account fella. A few weeks later they were all very polite. Bono surprisingly was very quiet. I asked Adam if they would be playing in Manchester. They had at this time not released the JT Album. His answer was he didn't know. They kinda got told where to play, but he did remember visiting the same house years ago, and he also mentioned my gran made the best chips he had ever had..Neither of them bought the Mr Colman house. The man who owned it didn't really want to sell at this time, but Bono did buy his house around the corner up the Vico road where he still lives today, and Adam bought his house in Rathfarnham where he still lives today. As someone that experienced the Dublin ambient of the late 70's/early 80's, what was so special about that city and that era that led to this wave of rock & roll bands and performance artists, with U2 being the most iconic representative? I never lived in Dublin, but I spent probably 13 weeks a year there from being 4 to being 21 with my gran, so I guess it qualifies me to answer this. Probably the reason i loved it so much was I was just a normal kid from a middle class working family in England whose gran worked for a very wealthy family, who had a very big house etc so I kinda got to see a lifestyle I could only dream of and got to meet lots of famous people. Dublin in the 70's and 80's was a very different place. The north of the city was quite run down and still quite hostile, but the south side was beautiful. Dalkey in particular is a fabulous place with lots of rich and famous people living there. Bono, The Edge, Mauve Binchy, Chris De burgh,Enya and Joe Walsh from Def Leppard had a house at one time nearby. Van Morrisson also rented one of the properties from the family my gran worked for. He was quite a grumpy miserable soul. I remember once knocking on his door to ask him to sign a birthday card for me and he refused haha. Dublin itself holds so many great memories for me. It had great character that in some aspects it has now lost. I try to go back every couple of years to see friends but the unemployment back then was quite high and cost of living very high so most of my child hood friends either moved to the UK or America. What do you think of Songs of Experience and the current tour? How does it compare to other U2 albums and epic tours? In your opinion, what do you see the band doing after this tour? After this tour I hear rumors of the end etc. I disagree with that. Larry has had bad hands since the Unforgettable Fire days. That always comes up as maybe a reason, but in my opinion the boys are having a great time. So I think they will take a long rest. Larry and Adam will have family time. Adam is a dad now and his kids are young, so I think they will disappear in to the background. Bono and Edge will still be around doing other stuff but with social media I am sure we will all see what they are doing. How different is U2 compared to other artists that you like? This is the easiest question to answer. U2 have spoiled me seeing any other band ever in the past and now haha......I have been lucky enough to see lots of great bands I grew up with or current bands: The Stones, The killers, Oasis, The Alarm, Metallica, The Smiths, Morrissey, New order, The Stone Roses, Travis, Foo Fighters to mention a few. All are great in their own right and I enjoyed seeing them all, but nothing gets anywhere near U2. They set the bar so high and keep raising it every time you cannot beat the excitement of looking forward to a U2 gig from the moment they are announced to the moment you see them. For a few days after seeing them and you know it is gonna be a while it does get quite depressing. What are your hobbies and interests away from U2, musical or otherwise? My hobbies away from U2 are mainly traveling, spending time with my family out in the fresh air walking my dog and generally just spending quality time with friends, seeing local bands etc. I did play in quite a successful UK based U2 tribute band as bass player from 2000 to 2014. I loved doing that. A lot of you get your pics taken with our singer Tony Jonson at gigs in the UK and ireland. We just need a drummer who can play to a click track to get it going again. That's something that might happen next year. U2 have been and are still a massive part of my life through good times and bad they have always been there. I have met some great people and made some great friends and all of that is really down to my gran who is unfortunately no longer with us, but she was an inspiration in my life who i will never forget. How many people can say that their gran took them to their first gig when she was 58 years old and I was just 10, and it was a band who I never imagined in my wildest dreams would become so big, and that band is the one we all love: U2. Thanks for this interview andyuk36! Note: Our crew members choose the fan of the month, you can't sign up for it. Thanks for the interview Andy! Wow, so many memories. I felt like someone close to the band was guiding me through all U2 eras. What memories you have of the Point Depot shows in 89? Originally posted by cesar_garza01 :Thanks for the interview Andy! Wow, so many memories. I felt like someone close to the band was guiding me through all U2 eras. 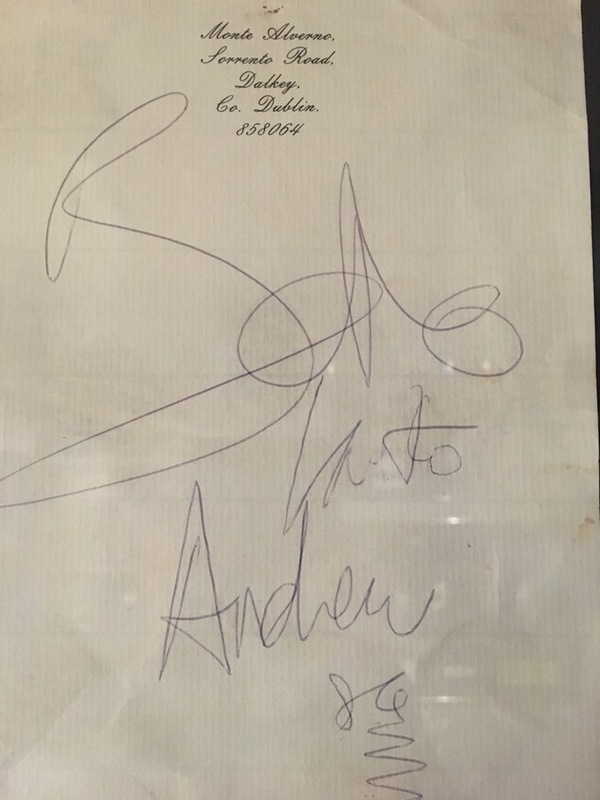 Here are a couple of autographs I got from when Bono and Adam visited the house in Dalkey in 1986...Selfies weren't around around in those days days just good old Autographs. That is awesome. What a story. An amazing FOTM interview. Some great stories to tell and a cracking bunch of shows to list as well. Andy. This is a really special story. Thanks for sharing with us. What an amazing gran you had. As you say how many would take a child to a gig and then buy you albums. What a wonderful woman. I'm of Irish descent like you, and my mum encouraged me to go to my first gig - a little older than you at 15, at the MK Bowl. Take care and the mighty Clarets will come good again soon! What a beautiful story! Thanks for sharing! Thanks for sharing your wonderful U2 journey, an amazing and very enjoyable read! Most critics agree that the song 'Acrobat' has to do with Bono's views of being a rock star in the post-JT days.